Here in the southern reaches of North America, we’re fortunate to have opportunities to view birds that are far more common far more south – like neotropics south – with some regularity. You Yankees may have your nesting warblers and winter finches, but in the sunny south we are wild with waders, which have the advantage of not only being generally gaudier, but much much easier to photograph. My home state of North Carolina can probably be considered the northern edge of the south, which means that when one of these long legged beauties wanders up across our state line it’s a pretty big deal. We get Reddish Egrets uncommonly, but annually. Wood Storks can be reliably found at a couple sites tucked along the southern coast. But the one that gets everybody in the state riled up is shaded pink, a once every few years visitor with too wild to be true cotton candy plumage and too weird to be true broad bill. And there were a couple of them recently reported down at the southern tip of North Carolina, so I had to go and have a look. My traveling companion was fellow Triangle birder and blogger Scott Winton, whose Durham County big year last year is the stuff of legend. I agreed to drive if he agreed to tally the road birds, and just over three hours after we left Durham we rolled up to the west end of Twin Lake, not more than a steroid enhanced stone’s throw from the South Carolina border. We spotted our quarry before the car even came to a stop, it’s nice when state birds are so forthcoming. And upon exiting we were treated to supremely satisfying views of a pair of young Roseate Spoonbills. 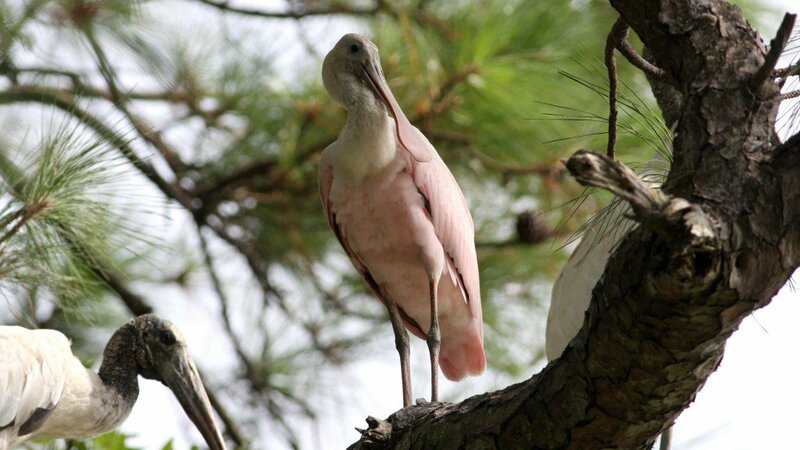 Our spoonbills were slumming with the large flock of Wood Storks that are routinely found roosting in the pine trees surrounding the golf course ponds. 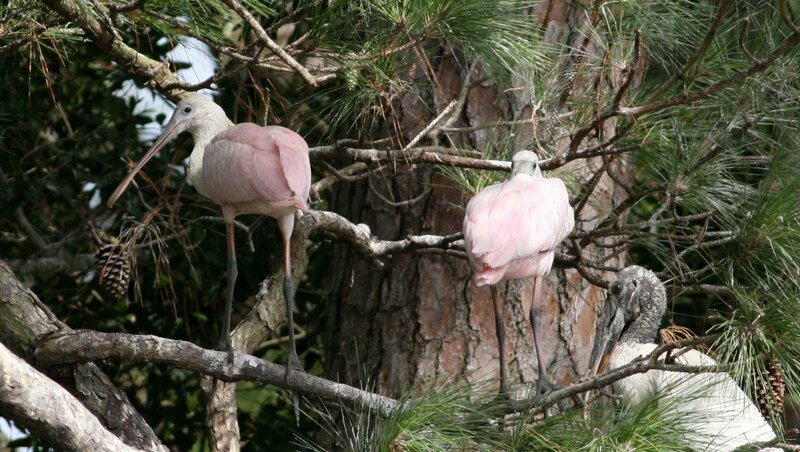 It’s perhaps odd to find Roseate Spoonbills in a pine tree, as the classic image of the species involves shallow marshes and wading instead of anything arboreal, but this is how we see them more or less. 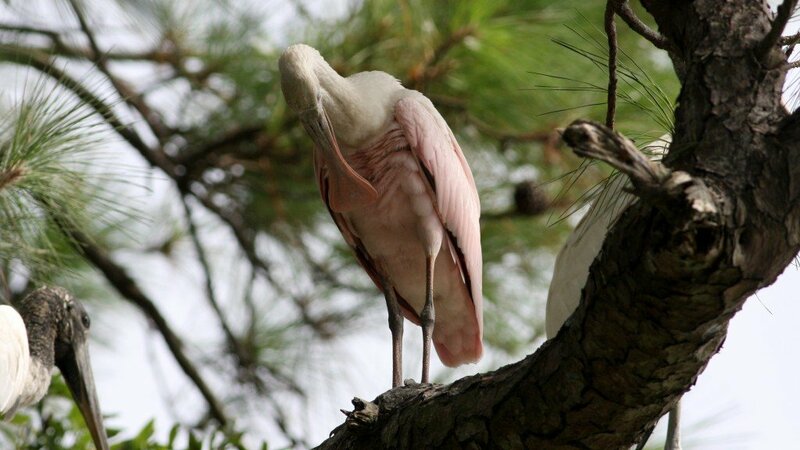 The vast majority of Roseate Spoonbill records for the state have come in this very spot in this very circumstance. This pine tree view puts me among almost every listing birder in the state. The fraternity of the perching Spoonbill. Look at that bill! Just look at it! A grotesque paddle affixed awkwardly to the front of its head, more like a mixing spoon or a spatula than a teaspoon. Just a bizarre bird all around. There have been several birders down to see this pair in the last few days. If they’re like the spoonbills that have graced our state with their presence in the past, there’s a good chance they’ll be here for quite a while. It’s a perfect storm for a state rarity, one that shows up infrequently but generally sticks around when it does. It would have to be if I, hesitant chaser as I am, manage to see it. So thanks Roseate Spoonbill. It’s nice, from time to time, to be reminded of what makes birding in the south so special. Nice! And of course you got me thinking. Besides the various spoon and fork birds, what other species are named for kitchen utensils? Several years ago, a Roseate Spoonbill showed up in a cornfield near Vandalia, Ill.
That was one strange environment for a spoonbill. Spoonbills are outstanding birds. We have a small population of Royals here in New Zealand, I see them sometimes in Poirua. Nate, I certainly hope our next chase is for an NC Fork-tailed Flycatcher!